Produced By Todd Rundgren, Jim Steinman. Steinman, who penned Meat Loafs Bat Out Of Hell LP takes center stage on this originally intended for Meat Loaf follow-up. The LP is filled with passion, romanticism, sexual yearnings and drama, all conveyed in Steinmans vivid imagery and surprising vocal flair. Roy Bittan and Max Weinberg of the E Street Band, vocalists Rory Dodd and Karla DeVito (who shared vocals with Meat Loaf on Paradise By The Dashboard Light) Rundgren, Ellen Foley and others contribute to the project. Steinmans songs are like mini-novels with a good portion of them running seven minutes and over. Yet the pace remains intense throughout. So says Jim Steinman, author of Meat Loafs mega platinum Bat Out Of Hell LP, whose own debut album Bad For Good on Cleveland International/Epic was recently released. Steinman, who again has written all the material for Meat Loafs long-awaited follow-up says the Meat Loaf album will be intentionally dissimilar from Bat Out Of Hell and Bad For Good expressing obvious concern that both LPs wouldnt conflict. 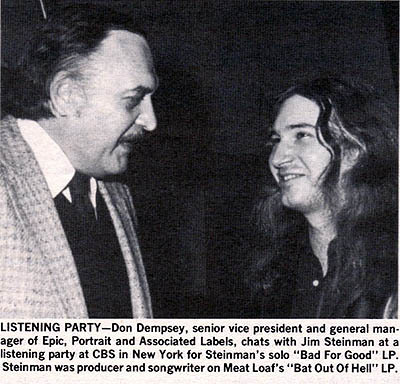 Steinmans LP was originally intended to be Meat Loafs follow-up until it was time to lay down the vocals. It was then, says Steinman, that Meat Loaf opened his mouth and no sound came out. So Steinman, who was going to record his own LP anyway, picked up the ball and recorded his own songs with Todd Rundgren producing. As a result, Steinman juggled his own album with the writing of Meat Loafs LP, all the time tying to give both albums separate identities. To the surprise of many, Steinmans vocals sounded stronger than expected, unusual in as much as he hasnt sung since 1973. He couldnt sing for two years after that, the result of a broken nose sustained in a bar fight. Surprisingly, Steinman grew up with opera, so one of his seven or eight minute epics sounds like a jingle to him when compared to a five-hour opera. Half of the songs on Bad For Good were actually written for it. Im into the idea of someone putting on the headphones and listening to a film, he says. Steinman admits that when working on Bad For Good he wanted each song to be of anthem like proportion, which explains the passionate, urgently charged personality of the music. Steinman hints at a few possible dates with Rundgren and DeVito and then a tour with Meat Loaf where both albums will be incorporated. And then again, DeVito has her own LP due so there could even be a three-way tour.